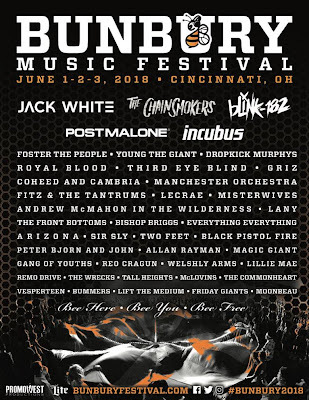 Now in its seventh year, the Bunbury Music Festival will take place once again this weekend in Cincinnati. This year the headliners are dance-pop duo The Chainsmokers on Friday, 90’s alt-rock survivors Incubus on Saturday, and the legendary Jack White will close out the festival on Sunday night. Additionally, over 50 bands will play during the weekend including, Third Eye Blind, Blink-182, Manchester Orchestra, Remo Drive, Lecrae, Coheed And Cambria, Royal Blood, Bishop Briggs, Post Malone, Foster The People, Welshly Arms, The Front Bottoms, Dropkick Murphys, Young The Giant, Lillie Mae, Fitz and The Tantrums, Friday Giants and many more. Stay tuned this week for more Bunbury-related content including, exclusive interviews and a special 3 Songs: On Repeat dedicated to Bunbury bands!